Fees associated with filing patent applications in Canada as well as other patent fees are available in the fee calculator. The term for filing a patent application in Canada claiming conventional priority is 12 months from the priority date. Restoration of the right of priority is not available in Canada. Canadian patent applications may be filed either in English or French, but the language of filing must be consistent throughout the application. - signed small entity declaration, if applicable. Submission of the Priority Document is not usually required unless it is requested by the Canadian Patent Office. If the priority is claimed, an applicant should inform the Commissioner of the filing date, country of filing and application number of the previously filed application within 16 months of the priority date. No Power of Attorney is required when filing a patent application in Canada. If the applicant is the inventor, the application must contain a statement to that effect. If the applicant is not the inventor, the application should include a statement indicating the name and address of the inventor and either a declaration that the applicant is the legal representative of the inventor or a declaration as to the applicant’s entitlement to apply for and be granted a patent. Patent applications in Canada undergo formal and substantive examinations. The substantive examination must be requested and the official fee must be paid within five years from the filing date. If the request is not filed and/or the examination fee is not paid in due time, the application will be considered abandoned. However, an abandoned application may be reinstated within 12 months of the expiration of the term for making the examination request upon payment of the reinstatement and examination fees. It is also possible to request an accelerated examination under PPH. If the disclosure of the information on the invention is made by the applicant or any person who obtained information on the invention directly or indirectly from the applicant within 12 months before the date of filing, such a disclosure does not disprove the novelty of an invention. A grant fee for patent registration in Canada is due within six months from the Notice of Allowance. Patents in Canada are in force for twenty years from the filing date. Maintenance fee payments are paid in advance, on or before each anniversary of the filing date, starting with the second anniversary. Late payment is possible within a twelve-month grace period after the due date by paying a corresponding reinstatement fee/ late payment fee. Average processing time for patent registration procedure in Canada is 2 years from the date of the examination request. Utility model protection is not available under the Canadian legislation. For foreign patent applicants, it is necessary to perform the patent prosecution in Canada through a registered Canadian patent agent. 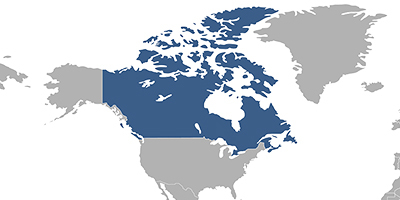 Online Database for Canadian Patents Search.